Frequently Asked Questions We have the answers! I would like to buy some shirts for my team/school/event. Can we order from you? Thank you for considering us, but at this time we are not set up for sales to the end users. We will gladly get you in touch with some of our clients (HINT: Try the Testimonials page) who would be able to help you better. They can assist with selecting the proper garments (materials, colors, cost, durability . . .), the right sizes, will provide you with information on artwork and production and so on. All our current customers can just fill out the online Order Form or email us the pdf version. New customers, please contact us beforehand. Can we come and visit the facility? Is all the work really done here in Eastlake? All prospective and current customers are more than welcome to stop by. If you give us a heads up, we might be able to have some food waiting! Can our clients come and pick up their merchandise at your location? NO, we are not set up to deal with end users directly. Please do not send them here! Will you blind ship to our customers? ABSOLUTELY! We will gladly ship to your customers and will take every precaution to eliminate any information about us from your shipment. We will also include any paperwork you provide. It is a shipment method in which our return address on the packaging is replaced by yours. This way the customer does not know where you get the work done while you save on shipping (by not shipping the merchandise back to your facilities first). How do we know you are not going to steal our customers if you blind ship? We are not setup to handle the retail customers, see question number 1. How does your pricing chart work? I don't get it! What's with all the surcharges? The chart allows us to calculate the pricing for different qyt and complexity. First choose the number of ink colors you will need. Then cross it with the number of garments you will be ordering. This is your standard charge. Each color incurs a setup/screen charge. So add $15 for one color, $30 for two, $45 for three . . .
printing light colors on dark garments requires flashing. So in this case we have to print twice and thus the “flash surcharge” of $0.15 per garment. If we are printing on light color shirts, this charge does not apply. If we are printing on anything but a T-Shirt, there might be a surcharge to compensate for the longer production times. Nylon, fleeces, hoodies and front sides of polo’s are more difficult to print on and have a per garment surcharge. Just like the flash multiply by the number of garments and add to the total. Specialty Inks. This would be the gels, 3D, glitters and such. Special screens and prep techniques are required to print them. They are also more expensive and often use higher quantity of ink (3D and Gel can use 10 or more times more ink). If you are not ordering any specialty inks, there is no surcharge. Art Charges, see Question 1. Ink Color change. If we are printing the same design but in more than one color, add the “Ink Color Change” charge. This covers the time and chemicals needed to thoroughly clean the screens and prepare them for the next ink color. Each change is $10. Pantone Match. Only applies if we are blending the custom ink color. 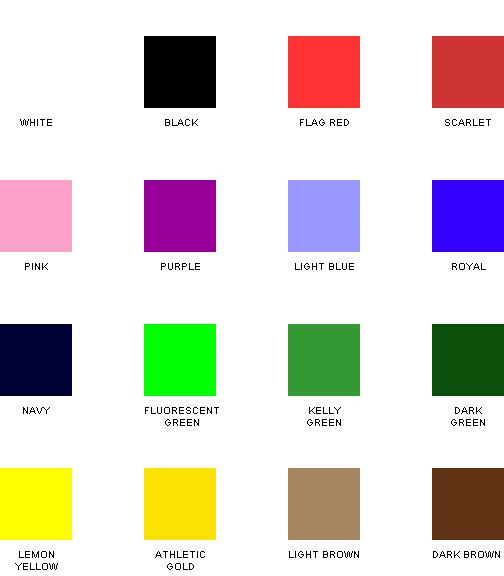 If you are using one of the colors listed in our ink chart (at the bottom of this page), no charge will apply. Order counting. If you would like us to verify your shipments from the distributors, there is a $2.00 charge per box. We realize that this is an odd surcharge, but it takes time to count and sort the orders and we have to be compensated for it. 999 times out of a 1,000 everything is OK, but we have seen orders with complete shipping lists in the box, but with product missing. So, if you would like us to verify the count, please let us know and will add it to the invoice. As much as we would love to be perfect, we are only human like everybody else. Spoilage is the mistake allowance of 1% per order. In other words, if you order 100 polo’s, we are allowed to make one mistake. If it is more than 1% we will either replace the product or compensate you financially. There is a limit though of $20 per garment. Can we be bribed with milkshakes and lunch? Lunch might be questionable, but ice cream usually works!!! Milkshakes don’t carry as much clout as icecream, but will score you some brownie points!!! Speaking of, brownies, they are an option too! What size images and what format do you accept? Artwork should be in vector format an .ai or .eps are preffered. If that is not possible, it should be as close as possible to the original size and at 200dpi or better. Everything else will require work and thus incur artwork charge. Acceptable formats are pdf, jpg, tiff. Some others might be supported. Please contact us for more information. Web page artwork is only 72dpi and is not suitable for printing. embedding a 72 dpi image into the 300dpi or upconverting it to needed resolution does not work either! The art needs to be 200 or better dpi originally or we will have to spend time cleaning it up (and thus incurring the art charges). How do I know what the charge is going to be? Feel free to send us the file and we will give you an estimate! -If you send us artwork in 300dpi and is in actual output size, there will be no charge. Placement for Large shirts. Adjust up or down 1/4″ per size. Our current turnaround time is ten (3-5) business days after receipt of Garments, P.O. and Art approval. What do you mean by top of the line commercial grade equipment? Exactly that, the best the money can buy. Our automatic screen printing press is an MHM. All of these are brand new or recent models. The complementary pieces are made by Interchange, M&R NuArc and Rototex. We use high quality high grade chemicals (all non toxic and drain safe for good working environment), aluminum screens by Xenon . . .
To top it all off, unlike the other print shops, we are in a fully air conditioned space which insures the worker comfort, reduces the fatigue during the long summer hours (when most other shops are working in 100+ degree conditions) and thus are able to provide you with year round consistency and quality! What is the difference between Shimmer, Metallic, Crystalina, Glitter and Holographic ink? They are all metallic inks with a different amount of glitter. Shimmer is very fine and thus rather subtle. Holographic is most prominent and is a best choice for ladies shirts requiring shiny/glittery effects. Crystalina works best on white or clear colors and has a pearlescent effect. Suede? What do you mean by SUEDE Ink?